In an earlier TIPsy Tuesday, I suggested raiding your storage spaces for other craft supplies you could use for paper crafts. Have you gone "shopping" in your cabinets and closets yet? Paint was one of those things we all have a little of somewhere. 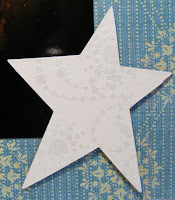 I used some acrylic paint to quickly and completely coat these chipboard stars. However, they were a little dull with just paint as you can see in the photo. So to add some umph, I stamped them in a similar color ink using dotted circles and a dotted spray from Inkadinkadoo. This 'tone-on-tone' effect adds some visual texture without making the design busy. To achieve a good tone-on-tone affect be sure to make your ink color either the same shade or just a shade darker than the base layer. 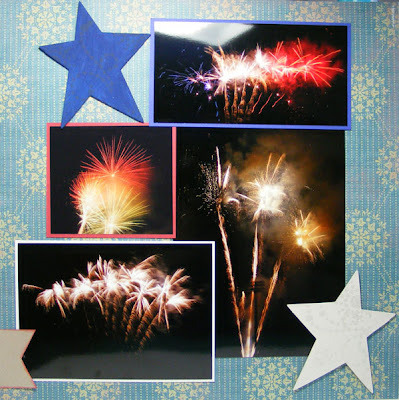 The white star really sparkles thanks to some crystal embossing powder. After inking with Very Vanilla craft ink, I could just apply the embossing powder and heat. I LOVE craft ink because of its easy embossing feature. So for some extra jazz or some extra class, try a little tone-on-tone in your projects. 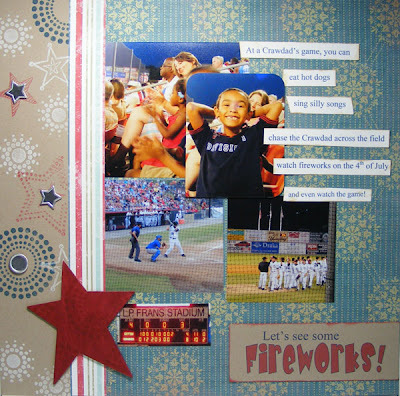 Paper: Western Sky DSP and Kraft from Stampin' Up! Ink Colors: Real Red, Riding Hood Red, Night of Navy, Very Vanilla,and Whisper White from Stampin Up!